FOOTBALL IS still number one in South America, but anyone present at Estadio Charrua in Montevideo on Saturday afternoon when Uruguay took on Russia will be aware that there is plenty of passion for rugby too. The crowd was in fine voice for a stirring national anthem and that vocal support continued throughout the 80 minutes, although it’s impossible to condone the whistling that accompanied every Russian place-kick. The noise reached a crescendo when the final whistle blew on the second leg of the play-off final and sealed Uruguay’s passage to the 2015 World Cup. Los Teros may have lost the first leg in Siberia 22-21, but they came out on top against the Russians at home to win 36-27 and earn a place in their first Rugby World Cup for 12 years, where they will play in Pool A with England, Australia, Wales and Fiji. Welcome back! With the arrival of a second South American team in rugby’s showpiece tournament alongside Argentina, it’s worth looking at the wider picture and the growing popularity of the oval-ball game on the continent. That is shown in the finer details. The man on the bus in Buenos Aires sporting an Ulster rugby shirt. The rugby pitch located on a patch of grass between the River Plate and a dual carriageway in Montevideo, and the gent walking alongside it decked out in an All Blacks jacket. More pertinently, there are the Argentine schoolchildren who, following Los Pumas’ victory over Australia in the Rugby Championship, picked up a football last week and started to pass it to each other. A famous win always helps to generate a buzz – so too a famous trophy. The Webb Ellis Cup has visited various clubs and schools in Argentina and Uruguay over the past few days as part of the Rugby World Cup Trophy Tour, receiving many an ecstatic reception. 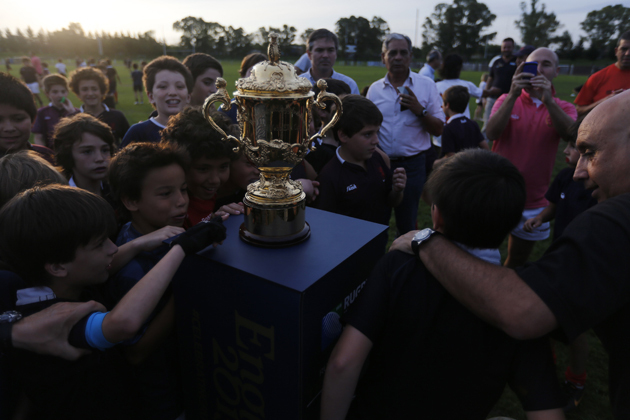 Children at Buenos Aires Cricket & Rugby Club swarmed around the trophy when it visited their ground on Wednesday to mark the club’s 150th anniversary. The numbers in attendance – more than 100 boys aged 12 to 14 were training – would have made many a UK club envious. The kids enjoyed the fact there were cameras capturing the action too, three doing the can-can as a lens approached when they bound together for a scrum. Another young boy was simply entranced by the trophy, staring into a golden reflection for a few minutes as if he couldn’t believe the sight in front of him. When the Webb Ellis Cup made an early-morning visit to Colegio Cardenal Newman – alma mater of Felipe Contepomi – the following day it was greeted by rapturous applause. It was a similar story at San Pedro Claver school, where children lined the walls and the balcony to get a glimpse of the trophy. Over in Uruguay, a plethora of mini rugby players from various clubs took to the field at Estadio Charrua ahead of the play-off final and when the Webb Ellis Cup made an appearance on the pitch it drew quite a crowd. The passion for rugby is obvious and there is plenty of potential to tap into as well. Premiership Rugby’s award-winning HITZ programme hopes to do just that. The project in Argentina, which is supported by Land Rover and the British Council, is aiming to introduce 40,000 young people to rugby over the next three years, which can only help in generating future generations of players. 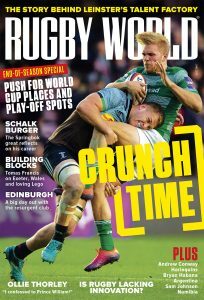 Rugby is never likely to replace football in the affections of South Americans but there are more people picking up the oval ball – and with Uruguay and Argentina both now part of RWC 2015 who knows how popular the game could become. 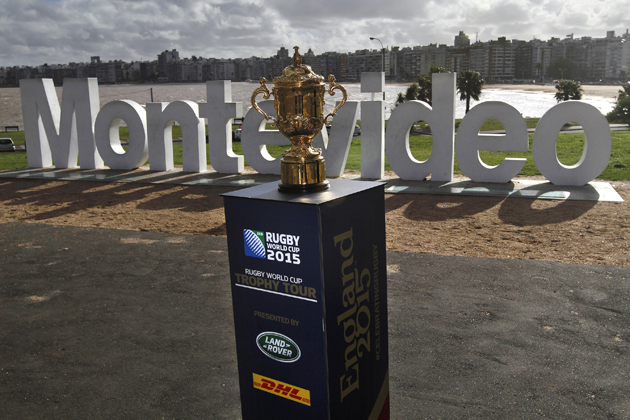 Land Rover is a worldwide partner of Rugby World Cup 2015 and a presenting partner of the Rugby World Cup Trophy Tour. Follow @LandRoverRugby on Twitter for exclusive video, imagery and insights.